Banbury enjoyed a superb victory against Lutterworth in the ECB National Club Championship, winning by 52 runs on Sunday. Despite being short of their county players, who were on duty for Oxfordshire, for the Group 12 fixture at White Post Road, Banbury got off to a great start with openers Ollie Clarke and Tom Bartlett giving them a solid base. Bartlett was out for a quick-fire 48, with six fours and two sixes off 44 balls, and, at 98-1, Banbury were well placed. However, some tight mid-innings bowling by Lutterworth put the squeeze on and Banbury struggled to score for ten overs. Justin Lambden 28 and Clarke, who hit 68 off 120 balls, got the innings back on track. 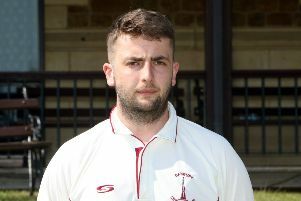 A fine partnership of 65 in six overs between Charlie Hill 57, which included three fours and two sixes, and Josh Megson, who hit 39 off 16 balls with six fours, saw Banbury reach a par score of 268-5 off their 50 overs. Openers Oliver Pickering 32 and Matt Pickering 32 saw Lutterworth make a good start in reply before they lost their first wicket with 73 runs on the board. But some tight bowling from Banbury saw Lutterworth kept in check, Imran Mohammed and Jack Wilkins both doing a cracking mid-innings jobs. Jarrad Pickering 28 and Alec Sim 26 got the innings back on track but wickets began to fall at regular intervals with few runs being added before Karl Smith 18 upped the scoring rate. Wilkins was comfortably the pick of the bowlers with a cracking spell but the wickets were spread around with a couple of good run-outs as well as Lutterworth were bowled out for 216 runs in the 42nd over. Wilkins finished with 2-31, Hill took 2-35 and Mohammed claimed 2-50 as Banbury booked their place in the next round.